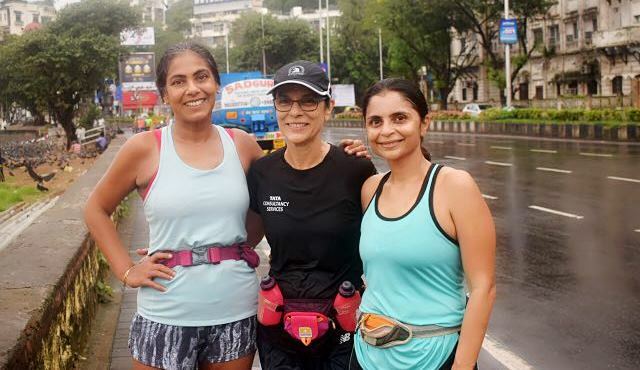 Photographer, illustrator and recreational athlete, Ayesha Broacha started running ten years ago primarily to build her stamina. 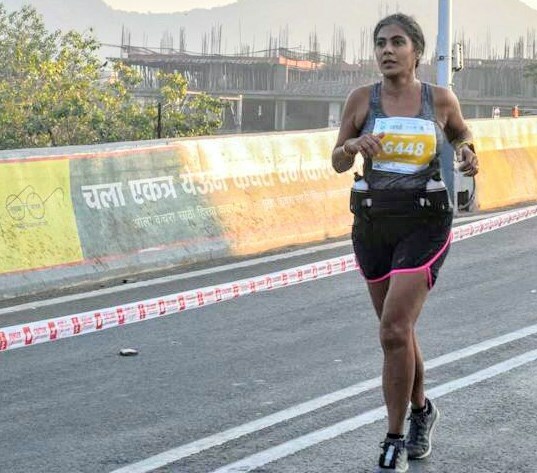 Soon, she was participating in running events in Mumbai, Delhi, Goa, Hyderabad, Satara, Bengaluru, Ladakh and Durshet among others. Friday, a day ahead of the 5 km discipline at Swimathon, I went for a swim in the sea. It was an attempt to get a feel of the water, where the event was scheduled to be held. As soon as I put my face in the water, I began to have a panic attack. The water was muddy. I was overcome with claustrophobia and my heart started pounding so fast that I seriously doubted being able to continue. I was very concerned about my ability to attempt the swim the next day. This was not the first time I was doing an open water swim. 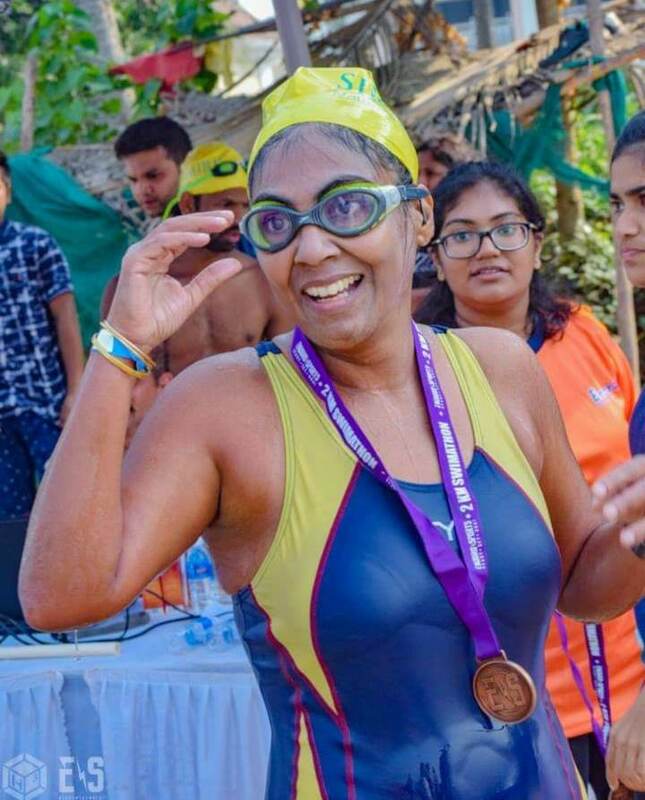 Last year (2018), I had attempted the two km swim and thoroughly enjoyed it. It was enough to prompt me to register not just for the 5km category this year but also the 2km one the following day. In 2018, I had swum the distance using breast stroke. This time around I was attempting to cover the distance swimming freestyle. The change in style required me to be face down in water more often. Breast stroke spares you that. The trial in sea turned muddy, wasn’t at all comforting. On the day of the event, I was very nervous, and couldn’t shake off the discomfort of the previous day’s experience. I got into the water trying my best to rationalize with myself. However as soon as I put my head in the water, once again I felt suffocated. My goggles felt too tight, and I contemplated taking my ear plugs out even though I knew that water in my ears wouldn’t be a pleasant sensation. I started doggy paddling just to stay afloat and calm myself. I was the last one to get going in the race, which didn’t do much for my confidence either. But I knew that if I got started, I would be able to finish the swim, strong. The 5 km distance had to be covered in four stretches of 1.25 km each. It basically meant swimmers had to do two loops of 2.5 km. After my slow start I managed the first 1.25 km stretch quite well though the current was strong. The turnaround was easy. By the time I got to the second loop the current in the sea had become stronger. It was hard, swimming. The last 200 meters before the next turn was tough. In spite of swimming as hard as I could, I found I wasn’t moving forward. The current was so strong. By the time I got to the turnaround point I was elated, the finish was in sight. I could feel every muscle on my back. The return was not easy either. By then the tide was high and staying on course was challenging. I finished my swim in three hours, ten minutes and forty-four seconds. The longest I have ever swum at a single stretch in my life till now! My training for this event was akin to preparing for my first full marathon. The aim was to finish the distance, strong, with no pressure of timing. By my calculations I needed to be in the water for two and half hours. However as I learnt that morning, the sea is most unpredictable. Having finished the 5 km event I was feeling good to attempt the 2 km event the next day. It was my third day in water. I was determined to not let my paranoia get the better off me. Unfortunately I still took a while getting started. I knew what to expect but that did not help. I finished in 1:04:41. I really like swimming in the sea and am trying to understand it, so that I may overcome this newly developed fear and feeling of claustrophobia when I get into water. I am a self-taught swimmer. I used to swim freestyle but got lethargic and found it less taxing to swim breaststroke. Swimathon forced me out of my comfort zone. I embraced freestyle once again and have tried to improve my stroke, but clearly, there is a long way to go. During my school years at Rishi Valley School, I was engaged in almost every sport, but in a non-competitive way. I played tennis, hockey, basketball, kho kho and kabaddi; I also cycled and swam. Sometime after my second child was born, I took to playing squash but realized that I had no stamina. I started running to build my stamina. That was ten years ago. During my runs in Mumbai I used to see coach, Savio D’Souza on the road. I got to know him; he encouraged me to join his running group. Savio and his group would start their practice runs at NCPA (southern tip of Marine Drive). They would run up to Chowpatty and turn back. It was through that group that I met Pervin Batliwala. Pervin, I and a couple of other runners would run from Chowpatty to NCPA and back as that suited our daily routine. I have been doing my training runs with Pervin for the last eight years. She is extremely disciplined; she never misses her training. She is full of beans and enjoys dispensing advice to any runner who may or may not listen. We ended up becoming a fairly large group. I started running half marathons and then did a few full marathons. I have run the Mumbai Marathon, Airtel Delhi Half Marathon, Bengaluru Marathon, Hyderabad Marathon, Ladakh Marathon, Goa River Marathon, Durshet Run and Satara Hill Marathon; some of these events multiple times. I neither have a training plan nor do I have any ambitions around the events I wish to attempt. One of my friends, Ariez Kharas and a group of runners, started attempting triathlons. Last year (2018), he enrolled for Swimathon. That was how I got around to enrolling for my first shot at 2 km-swim. I trained at the Breach Candy Club swimming pool, which is a large circular pool. The training entailed swimming around the pool continuously to simulate the distance. As that edition of Swimathon was my first swimming event, I just wanted to complete it. Last year the number of competitors was small. It was a comfortable swim. When I finished I realized that it had ended quite fast and I hadn’t got my money’s worth. Hence the 5km-swim this time around. I will definitely continue to swim. I do not have any agenda, participating in events – the build up to an event is what is most fun and satisfying for me. The IAAF addresses a concern raised by Athletics Kenya. It is an issue and an explanation that should interest any top athlete running distances longer than the 3000m, not to mention fans of those distances. Absence of the 5000m race from the official Diamond League programme does not preclude individual Diamond League meets from hosting the event outside the international broadcast window. This has been mentioned in an official statement of the International Association of Athletics Federations (IAAF), dated March 31, 2019, issued in the context of concerns raised by Athletics Kenya over the exclusion of events longer than 3000m in the Diamond League programme. Sebastian Coe, president, IAAF and Jon Ridgeon, CEO, IAAF, have reassured Athletics Kenya that changes to the IAAF Diamond League format next year will not disadvantage African athletes. Coe, Ridgeon and Athletics Kenya president Lt. General (retd) Jackson Tuwei met during the World Cross Country Championships in Aarhus in order to avoid any misunderstanding between the two organizations over the new Diamond League format approved by the IAAF Council in Doha earlier this month, the statement said. According to it, Athletics Kenya was particularly concerned by the exclusion of any event longer than 3000m from the Diamond League programme next year and the reduction in the number of meetings from 14 to 13. Tuwei sought, and received, assurance that Kenyan and other East African athletes, who feature prominently in 5000m races, would not lose competition opportunities due to this process. Coe confirmed that the absence of the 5000m from the official Diamond League programme would not preclude individual Diamond League meetings from running the event outside of the 90-minute international broadcast window and that several meetings had already shown interest in hosting the 5000m. Ridgeon explained that the IAAF’s market research showed that producing a series that consistently featured the best athletes competing against each other was a key factor in improving the appeal of the Diamond League for broadcasters and fans, the statement said. 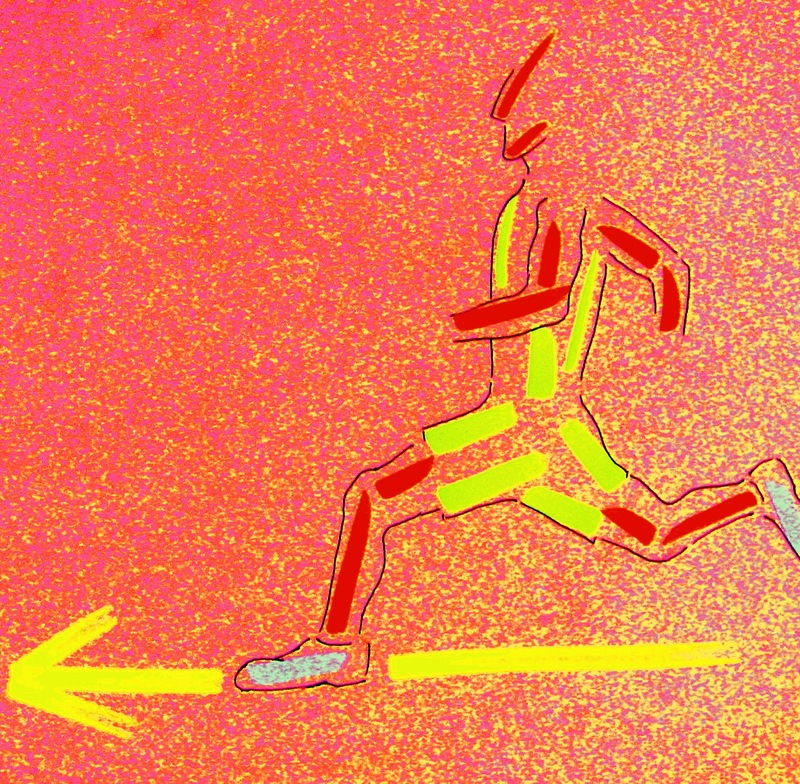 At the same time the 5000m runners, coaches and agents consulted during the process indicated that they were unlikely to run six races over that distance during the Diamond League series (last year no leading athlete ran more than two 5000m races during the regular Diamond League season). The 3000m distance was selected because it was more likely to attract the best distance talent more regularly. “ We believe that ultimately these changes will be beneficial not only to Kenyan and East African distance runners, but to our leading athletes around the globe, because it will result in a stronger, higher-profile, commercially-successful annual showcase series for our sport,’’ Coe said. “ And it’s important to remember that the IAAF will be creating other continental competition opportunities outside the Diamond League as we redesign the global calendar.’’ This he affirmed will increase opportunities for the athletes to compete, the statement said. According to it, Ridgeon emphasized the IAAF’s intention to review the new format at the end of the 2020 season and make any adjustments to the programme as required. Backdrop: According to Wikipedia, the IAAF Diamond League is an annual series of elite track and field competitions. The series began with the 2010 Diamond League. It was designed to replace the IAAF Golden League which had been held annually since 1998. While the Golden League was formed to increase the profile of the leading European athletics competitions, the Diamond League’s aim was to enhance the worldwide appeal of athletics by going outside Europe. In addition to the original Golden League members (except Berlin) and other traditional European competitions, the series now includes events in China, Qatar, Morocco and the United States.